Zercatto, a new online platform that enables investors to follow and copy expert trading strategies that realise an average ROI of 72 per cent. A Seedcamp funded company, Zercatto is the only trading platform where investors only pay if the strategy they are following is profitable; there are no commission fees, no management fees and no charges per trade. Gaspar d’Orey, founder of Zercatto comments: “Building and running your own investment portfolio is exciting, but it can also be very demoralising when you think that only five per cent of people who invest in the markets make money. Many investors get poor returns and give up quickly, either reverting to traditional saving models, where interest rates are low, or investing via IFAs or fund managers, which can be expensive due to additional fees and does not guarantee results. Investors sign up and pay a fixed weekly fee to follow an expert. The fee is set by the expert, but the investor only pays if the portfolio they are following that week is profitable. 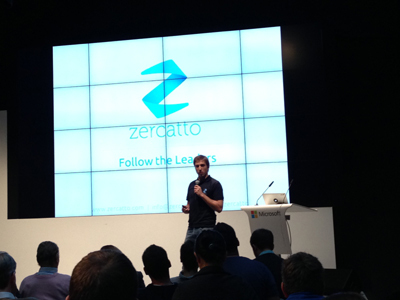 Zercatto is aiming to make investment a transparent, fair, realistic and fun activity for people who like to trade. It enables investors to remain in control; they choose which experts to follow and have total control over whether they trade and when they trade. Furthermore, investors have full access to the trading history of experts that they choose to follow so that they can avoid cowboy traders. Zercatto was founded by former fund manager Gaspar d’Orey to enable more people to learn about and invest successfully in the markets. As an investor (typically someone with an interest in the markets, but not enough knowledge or time to develop a successful portfolio), you sign up to Zercatto and can choose an ‘Expert’ to follow based on a whole range of factors including risk, asset class, geography, type of trader etc. You then pay a weekly fee to follow an expert and then get alerted via SMS or via the Zercatto app when the expert has made a trade, so you can then make the same trade. The key thing being that you only pay the expert if the strategy is profitable, so if you only pay if you make money. We do not believe in management fees, regardless of how low they are, and we do not believe in charging a commission on the trades you make. We do not believe that a single banker, or a team of bankers know what is best for your portfolio. We do not believe that you should rely on algorithmic trading; we believe that you should have complete control over your portfolio. We do not believe that indices should be tracked; we believe they should be beaten.